Do you want to develop the medicines of the future? Biopharmaceutical drugs are transforming the way we treat patients, fighting global diseases such as cancer, arthritis and hepatitis. This growing industry is generating a huge demand for scientists skilled in this groundbreaking field. This course has been designed to fast-track your career, rapidly equipping you with the skills to understand the many functions contributing to successful drug development, from discovery to commercialisation. It is the only course in the UK with a paid placement in the biopharmaceuticals industry, through which successful candidates will earn £20,000. Designed, developed and delivered in partnership with Covance, a major multinational pharmaceutical company, this is an opportunity to learn first-hand from industry professionals. Student, Beth Peacock (pictured above), has now secured a full time job at Covance, where she did her 12-month placement on this course. Listen to why she believes this course is the future of science and how it has prepared her for the sector: watch the video here. The course focuses on large molecule drugs: monoclonal antibodies like Herceptin, bio-similars and antibody-drug conjugates; gene therapies and the technologies that underpin the discovery and development pathway. You’ll be taught by qualified industry professionals who are working at the forefront of their fields in the areas of science that support drug development. Alongside this, you’ll learn how to operate in a corporate environment, for example how to present with impact and deliver reports to clients, regulator, investors and sponsors. Download a copy of our course brochure. 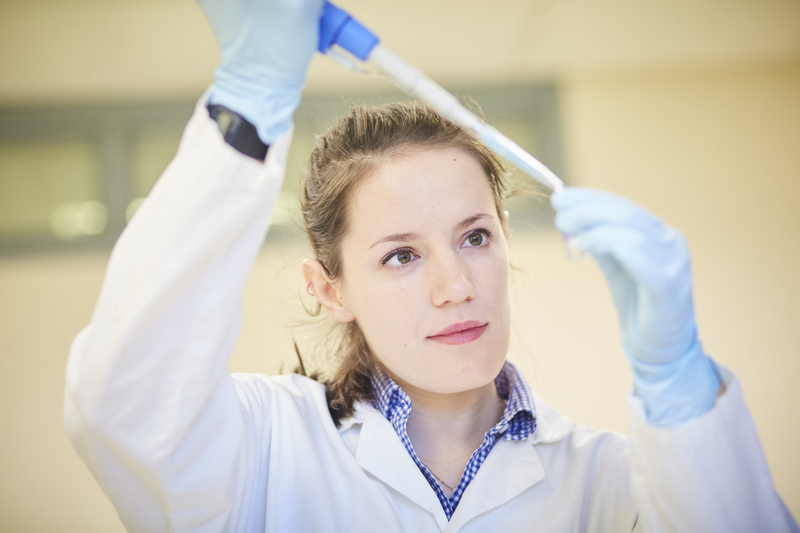 The course is 19-months long, with the first 7 months on campus at the University of Leeds covering all aspects of biological drug discovery, development and commercialisation. This provides you with an understanding of the many functions that contribute to a successful drug and how they are coordinated and integrated to bring new drugs to market in a timely and economic fashion. At least half of the teaching is delivered by industrialists, with the remainder delivered by academics expert in different parts of the industrial process drawn from 4 faculties of the university (Biological Sciences, Business School, Engineering, Medicine & Health). The curriculum is covered with seminars, tutorials, field trips and a series of substantial projects performed by the students in teams. the regulatory and legal aspects framework that ensure safe practice and the development of safe and effective medicines. The second half of your programme is an industrial placement assignment. This is a 12-month guaranteed work and research experience in industry or placement hosted within the university research laboratories developed and co-supervised with industry. Students can expect to earn up to £20,000 over the duration of their placement. 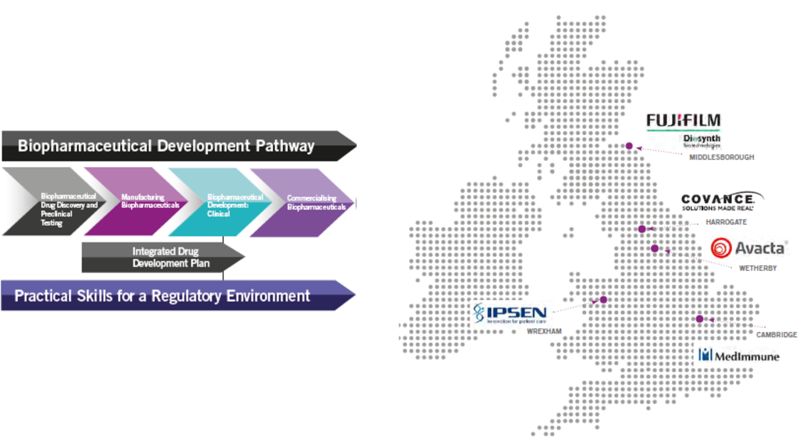 The placements will all include a practical research project where you will gain in-depth practical experience of at least one technical function of the drug development process (discovery, manufacturing, pre-clinical testing, clinical safety and efficacy). You will commence your project in May, six-months after the start of the programme and will be completed by the following April. Graduation is scheduled immediately thereafter, making you available for employment immediately after your placement. Find out more about the modules you will study. The learning and teaching on the course has been constructed to align with activities performed in industry, preparing you to be work-ready immediately after you finish. This course will challenge you to think creatively, solve problems and develop strong communication and teamwork skills. You’ll experience a wide range of teaching methods, including formal lectures, interactive workshops, practical classes and industry site visits. You’ll extensively use of real-life, industry specific case studies to illustrate theoretical and practical concepts and multiple opportunities to work in teams, including the opportunity to lead a team. A wide range of ‘authentic’ assessments will be used that students will experience in the workplace including submissions to regulatory authorities, client reports and presentations to industry panel members. Normally a 2:1 honours degree or equivalent in a Biological Sciences subject, Bioprocessing or Biochemical Engineering, but relevant experience may be taken into account. In addition, applicants will need to demonstrate leadership potential, which might be evidenced from academic, sporting, volunteering or other professional experience. completed supporting statement outlining your career intentions and state how your achievements / experiences set you up to excel on this course. Plus describe your leadership style and experiences and how you can become a future leader in biopharmaceutical development. copy of passport (if you’re an overseas student). Applicants who require a Tier 4 (general) student visa are not permitted to study our MSc in Biopharmaceutical Development. This programme includes a mandatory work placement that consists of more than 50% of the total length of the course. The UKVI Home Office will not issue a visa if the duration exceeds 50%. Further information can be found here. Placement salary = £20,000 (approx.) You will start receiving a placement salary of £1,333.00* per month after tax. Students who are self-funding will pay the tuition fee in 4 instalments across the duration of the course (September and February). If you are receiving a postgraduate student loan (up to £10,280) from Student Finance England you can set up an alternative instalment plan in line with your loan payments. In this case you will pay the tuition fee in 6 instalments across the duration of the course (November, February and May). A alternative payment option is available to allow you to defer part of your fees until you start your paid placement, see breakdown below. Please contact our admissions team to discuss these; fbsadmissions@leeds.ac.uk. There are other general living costs which you will need to budget for. Read more about paying fees and charges. Professional and Career Development Loans = between £300 and £10,000. Find out more. We award a generous range of scholarships and consider all eligible applicants who demonstrate outstanding academic achievement and excellent personal and professional skills. Visit our FBS fees and scholarships page to find out more about the range of scholarships we have to offer. This course will help give you the experience and skills to become highly employable. Many pharmaceutical companies are expanding their biopharmaceutical capability, which is creating demand and opportunities for talented, well-trained people. At the same time, these companies report difficulties in recruiting employees with relevant skill sets and those with broad industrial experience are greatly sought after. This course will give you a high amount of exposure to senior industrialists working as tutors throughout the course and can take this opportunity to obtain career advice. You’ll also work in industry full time for 12 months, which is an outstanding opportunity for you to develop a competitive career plan. With this degree, you’ll have the relevant knowledge and experience to fast-track your career as, for example, an analytical scientist, project manager, or coordinator, in areas such as research, quality control, manufacturing, project management, non-clinical, clinical, and market access. As a student on this course you’ll have unique access to an industry-mentor and a personal tutor (academic member of staff) for the duration of your studies. You’ll also get support in planning your career through sessions that develop your CVs and applications. For more information about the career opportunities that are available within the biopharmaceutical sector, please visit the Association of the British Pharmaceutical Industry careers website.